Warwick Valley High School’s varsity crew team is excited to announce the purchase of their first 8+ racing shell. The Vespoli V1-EL8+ features modern wing riggers and is the fastest, lightest nine-person boat the team has ever had the chance to race. This is WVHS Crew’s third boat, and their first 8+. The purchase of this boat is very special to the WVHS crew team—it represents countless hours of hard fundraising work, and offers more team members the chance to race. All crew team equipment purchases are self-funded. Crew team members would like to thank all the donors who made it possible for them to acquire this boat. The team looks forward to getting the new boat out on the water as soon as warm weather arrives! 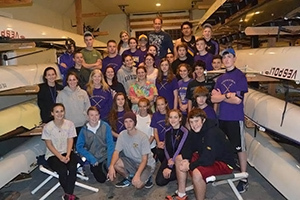 Warwick Crew is coached by Jim Cody and assisted by many volunteers who put in countless hours to work with the nearly 50 student–athletes involved with the team. Go Wildcats!